The United States Congress designated the Frank Church-River of No Return Wilderness (map) in 1980 and it now has a total of 2,358,940 acres. All of this wilderness is located in Idaho and is managed by the Bureau of Land Management and the Forest Service. The Frank Church-River of No Return Wilderness is bordered by the Gospel-Hump Wilderness to the northwest and the Selway-Bitterroot Wilderness to the north (separated by the Magruder Corridor and Highway 12). Few places in America, and nowhere outside of Alaska, provide a Wilderness experience to match the sheer magnitude of the Frank Church-River of No Return, the largest contiguous unit of the National Wilderness Preservation System in the Lower 48. It is second in size only to California's Death Valley Wilderness, which consists of many non-contiguous pieces. This area combines the old Idaho Primitive Area, the Salmon Breaks Primitive Area, territory on six national forests, and a small swath of land managed by the Bureau of Land Management. Senator Frank Church played a key role in the passage of the Wilderness Act of 1964, and his name was added to the Wilderness in 1984, shortly before his death. It is a land of clear rivers, deep canyons, and rugged mountains. Two white-water rivers draw many human visitors: the Main Salmon River, which runs west near the northern boundary; and the Middle Fork of the Salmon, which begins near the southern boundary and runs north for about 104 miles until it joins the Main. Reaching 6,300 feet from the river bottom, the canyon carved by the Main Salmon is deeper than most of the earth's canyons--including the Grand Canyon of the Colorado River--and this fast-moving waterway has been dubbed the River of No Return. In the northeastern corner of the Wilderness, the Selway River flows north into the nearby Selway-Bitterroot Wilderness. Trout fishing usually rates from good to excellent. The Middle Fork, the Selway, and nearly all of the Main Salmon are Wild and Scenic Rivers. Unlike the sheer walls of the Grand Canyon, these rivers rush below wooded ridges rising steeply toward the sky, beneath eroded bluffs and ragged, solitary crags. The Salmon River Mountains dominate the interior of the Wilderness. Without a major crest, these mountains splay out in a multitude of minor crests in all directions, and rise gradually to wide summits. 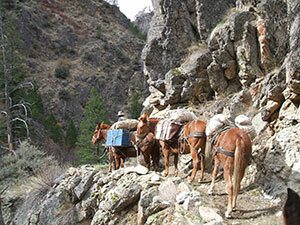 East of the Middle Fork, the fabulous Bighorn Crags form a jagged series of summits, at least one topping 10,000 feet. The Crags surround 14 strikingly beautiful clearwater lakes. Hiking up from the rivers into the mountains brings sudden elevation changes. Great forests of Douglas fir and lodgepole pine cover much of the area, with spruce and fir higher up and ponderosa pine at lower altitudes. The forests are broken by grassy meadows and sun-washed, treeless slopes. A dry country, as little as 10 inches of precipitation falls near the rivers. As much as 50 inches may fall on the mountaintops, but much of it is snow. Despite the dryness, wildlife abounds. As many as 370 species have been identified in a single year, including eight big game animals. Wildfire has been allowed to play a more natural role in the wilderness in recent years. Tens of thousands of acres have burned without the interference of humans, producing a mosaic of vegetation from severely burned timber stands in some areas to lightly burned grass slopes and understory in other areas. A network of 296 maintained trails (approximately 2,616 miles worth) provides access to this seemingly endless area, crossing rivers and streams on 114 bridges. This is a paradise for horsepackers. Thirty-two Forest Service Roads lead to 66 trailheads. Despite the extensive trail system, an amazing 1.5 million acres remains trail-free. Small planes are allowed to land on several primitive airstrips dating back to the days before Wilderness designation. Jet boats are allowed on the Main Salmon. Dozens of outfitters offer float, jetboat, horsepacking, backpacking, and ski trips. For information, contact the Idaho Outfitters and Guides Association, P.O. Box 95, Boise, ID 83701; (208) 342-1438. Planning to Visit the Frank Church-River of No Return Wilderness? How to follow the seven standard Leave No Trace principles differs in different parts of the country (desert vs. Rocky Mountains). Click on any of the principles listed below to learn more about how they apply in the Frank Church-River of No Return Wilderness.